This story comes to us from the Star Tribune as an article written by Amelia Rayno. Photo provided by the Hilton. While new hotels have cropped up all over downtown Minneapolis in anticipation of the Super Bowl coming in February, one of the Twin Cities’ longtime staples just got a major facelift. 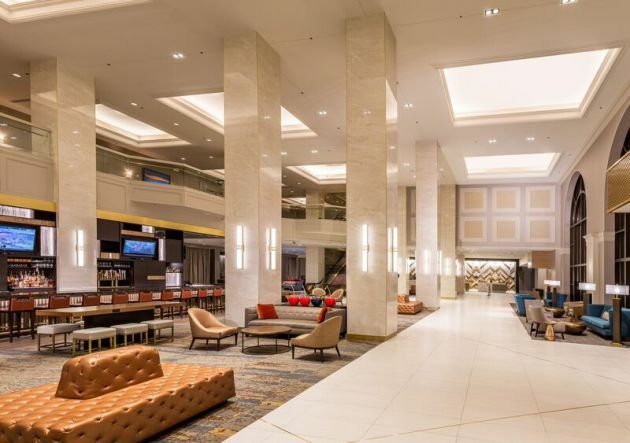 The Hilton – which happens to be the largest hotel not just in Minnesota, but in the five-state area – is putting on the finishing touches of a three-year, $27 million renovation that made over all 821 guest rooms, its meeting rooms, event spaces and the main lobby. "We tore it down to the studs and rebuilt it," said Kimberly Zoulek, the director of sales and marketing. "And we managed to stay open the whole time." The result is a dramatic change in appearance for the 25-year-old hotel – with stone floors and columns and brass fixtures replacing dark wood and an eccentric chandelier – along with new restaurant and market concepts and an increased focus on the bar area. Ten 01 Social, replacing the old Skywater, serves breakfast, lunch and dinner, focusing on approachable fare with international flair – including sandwiches, salads and main dishes that feature a lamb shank (pictured above) with chocolate mole and chickpeas, and sturgeon (pictured below) with cilantro sticky rice and bok choy. “Social plates” include the likes of spice-rubbed wings, crawfish croquettes, smoked lake trout and pork belly steam buns. At the 360-degree bar, which is four times bigger than the one it replaced, nine taps pour exclusively local brews; wine, seasonal cocktails and mocktails are also available. Happy hour specials ($6 plates and $2 off drafts, house wine and well liquor drinks) run on weekdays from 4 to 6 p.m. and from 10 p.m. to midnight. Where the dining area used to greet guests, front and center, a lounge area now takes the stage. A semi-enclosed separate dining room now sits behind the bar. Next to it, a breakfast buffet offers an omelet station, cook-to-order eggs and waffles, as well as the usual suspects in the mornings. The square buffet can also be booked for private parties and transformed into a bar-like space with stools and a cooking setup in the middle. 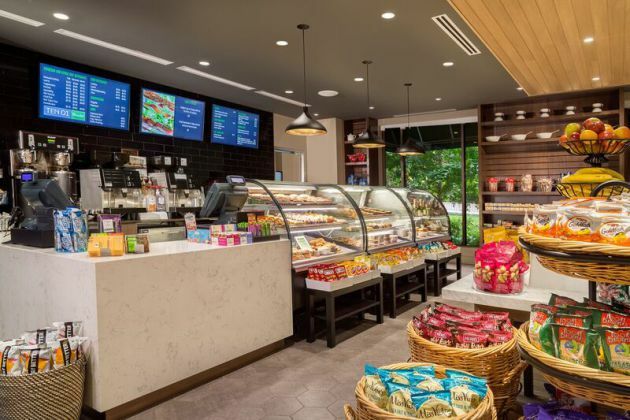 Also new to the space: the Ten 01 Market, which serves Starbucks coffee and housemade bakery items, breakfast sandwiches, flatbreads, packaged snacks and wine and beer. There is a separate street entrance to the market, which can be used by the neighborhood community as well, and an adjacent patio.